It’s not a good time to be alive for the nine million or so non-human species on Earth. Estimates vary, but as many as one third of all species are threatened or endangered, animals are going extinct anywhere from 1,000-10,000 times faster than normal, and since 1500, humans have driven hundreds of creatures off the face of the planet. One of the most recent casualties of this disappearing act is the baiji, a river dolphin native to China’s waterways, which is believed to have gone extinct in 2006. With the baiji gone for good, the title for most endangered marine mammal was up for grabs. There were a number of possible contenders, but the first prize was easily taken by the vaquita. The vaquita, which means “little cow” in Spanish, is the world’s smallest porpoise, and one of the cutest animals on the planet: measuring no more than five feet in length and weighing in at 120 pounds, the vaquita looks like a miniature whale with silver skin and black makeup around its lips and eyes. They’re the perfect combination of panda bear and orca: the cutest animals on earth. Unfortunately, there’s nothing cute about their story. Ongoing fishing operations in the Gulf of California have had a devastating effect on vaquita populations. In 1997, there were an estimated 567 vaquitas; as of November 2016, no more than 30 vaquitas were left swimming in the Gulf. That’s a shocking decline of almost 95% in just two decades. The story has taken an absurd turn as the Mexican government has requested the help of dolphins from the U.S. Navy Marine Mammal Program to locate the remaining vaquitas. Yes, you read that correctly: dolphins. Using sonar, dolphins can alert human crews as to the location of the vaquitas, facilitating their capture and transfer to a safe location. It’s a long shot, but conservationists believe it’s the best way to save the little cow. The vaquita was only discovered in 1958, when three strange skulls were found on a Mexican beach – an ominous sign of the direction the species was headed. The vaquita lives exclusively in the northern end of Mexico’s Gulf of California, an area roughly the size of Rhode Island that is home to a number of fisheries. 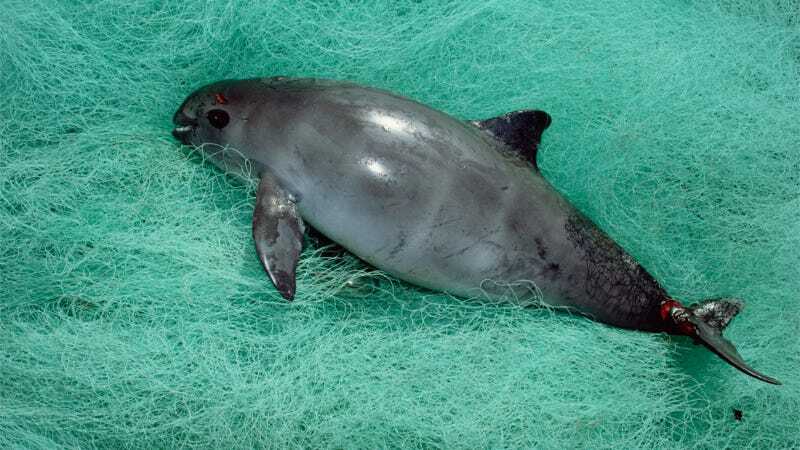 While vaquitas are not directly harvested, they often get tangled up in gillnets, a type of wall-like netting that floats in the water and traps fish by their gills. Because vaquitas need to come to the surface to breath, once they get trapped in a net they die quickly of asphyxiation. Although no formal counts were conducted until the mid 1980s, it was clear from the vaquita corpses tangled in nets that as fishing operations grew larger, the little cow was in more and more danger. In 1990, the vaquita was labeled as endangered, and in 1993 a population count found that there were hundreds, not thousands, of vaquitas left. As fishing in the Gulf continued, with more boats and more nets, it became increasingly clear that unless action was taken, the vaquita was headed towards extinction. The Mexican government was pressured into action, and, in 1993, established a gillnet-free “Biosphere Reserve” in the upper California Gulf. A few years later, in 1997, the vaquita was placed on the critically endangered list, and the International Committee for the Recovery of the Vaquita (CIRVA) met for the first time. In their first report, the CIRVA estimated the population of vaquita “could be clearly stated to be in the hundreds and probably the low hundreds”; they called for further investigation into the declining numbers, and increased habitat protection. But vaquita populations continued declining. And so in 2005, another Refuge Area for the Protection of the Vaquita was established, protecting the central part of the vaquita habitat from fishing and other harmful activities. But, according to the International Union for Conservation of Nature, “there was little enforcement and the [gillnet] ban was widely ignored.” And so vaquita populations continued declining. Further initiatives from Mexican government followed, with millions of dollars being put towards conservation. The government provided financial incentives to fishermen to take up other professions, and also paid for the development and implementation of different fishing gear, which would result in fewer bycatch. The combination of all these actions finally seemed to be producing some success; by 2011, despite the fact that there were at most a few hundred vaquitas remaining in the Gulf, the dramatic population decline appeared to be on pause. But the vaquita isn’t alone in the Gulf of California. The little cow shares its habitat with another rather strange fish: the totoaba. The totoaba is about the same size as the vaquita (growing up to 6.5 feet in length), is also endemic to the Gulf of California, and is also critically endangered. The totoaba is prized for its exceptionally large swim bladder (the organ that allows it to float at different depths), which is dried and sold in parts of Asia where it is turned into soup. Totoaba fishing operations existed in the Gulf of California for much of the 1900s, but declining totoaba populations caused Mexico to ban the fishery in 1975, and the fish is protected in both the U.S. and Mexico. Some degree of illegal fishing persisted, but it was only a minor problem. Then, in 2011, the price of totoaba bladders unexpectedly skyrocketed. It’s a bit unclear what exactly drove the uptick in the price of a dried fish bladder, but according to the U.S. Fish and Wildlife Services, a totoaba bladder now goes for $10,000 and up in Asian markets and sometimes more than $50,000 in China. The Mexican government wasn’t prepared for the dramatic increase in illegal fishing that was the inevitable result of the price hike. “It’s like trying to control traffic while someone’s throwing money from the Empire State Building,” Lorenzo Rojas-Bracho, a member of CIRVA, told National Geographic. It was hard to resist such a lucrative deal, and so illegal fishing and smuggling of totoaba bladders increased. In 2013, a 73-year-old man was caught trying to cross into the U.S. from Mexico with 27 totoaba bladders hidden under the floor of his car. Police subsequently searched his home and found 214 bladders. In all, he was in possession of 241 totoaba bladders, worth approximately $3.6 million on the black market. He was sentenced to a year in prison and fined $120,500. Meanwhile other boats and nets rushed in to fill the void and make life hard for these two critically endangered species. Vaquita populations plummeted, declining by about 18% every year from 2011 to 2015, leaving less than 100 remaining. In April of 2015, President Enrique Peña Nieto announced a new plan to protect the vulnerable species, which included an expanded protected area, a two-year ban on all gillnet fishing across a large portion of the Gulf of California, and patrols by the Mexican Navy to make sure that the protected area was actually protected. The report has a number of suggestions, including indefinitely extending the two-year ban on gillnetting, as well as proposing that a number of vaquitas be captured and placed them in a temporary sanctuary. Vaquitas are notoriously shy, and catching them without harming them poses significant difficulties. The plan will likely involve the use of trained bottlenose dolphins from the U.S. Navy Marine Mammal Program. Dolphins can use their sonar to locate the vaquita’s air-filled lungs under water, and then notify their handlers of their location. A squad of dolphins has already completed a trial run in San Francisco, where they successfully located harbor porpoises. Time is running out for the vaquita. Human action – years of overfishing, and a sudden demand for a foreign fish bladder — has driven this charismatic species to the brink of extinction.